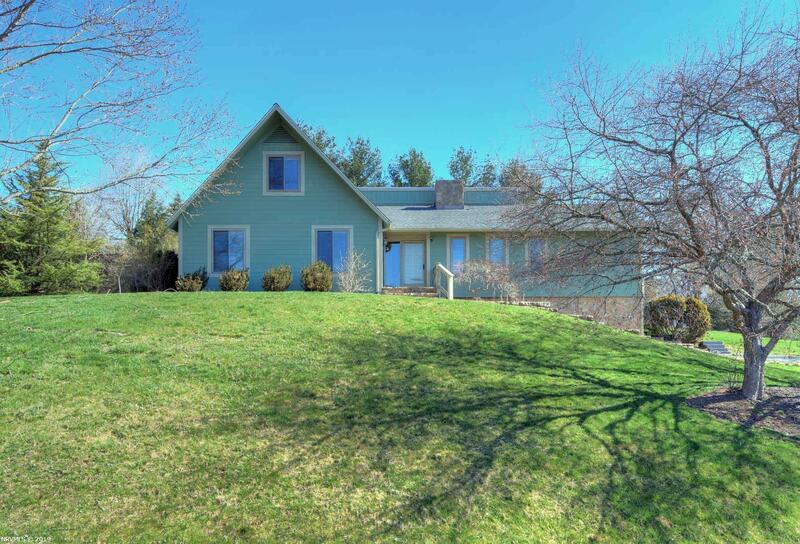 Gorgeous contemporary home located in the Blacksburg Country Club! This home is very bright and airy throughout! Living room, kitchen, dining, master bedroom, and two additional bedrooms all on the main floor. Vaulted ceilings for an open feel with a cozy fireplace in the dining room. Upgraded kitchen with a breakfast area with access to the back screened deck. The living room sits off from the kitchen with a large window overlooking the Ellett Valley and beautiful mountains. The upper level has a bonus fourth bedroom with numerous attic storage spaces, full bathroom, and sitting area. The basement is partially finished with a laundry area, built-ins, and a bonus recreational space. The basement has access to the freshly painted two car garage, stairs leading to back deck, and yard. Plenty of storage throughout the home! Completely overhauled with new exterior and interior painting, new roof, partially finished basement, among other upgrades throughout. Directions: Luster&apos;s Gate Rd To Rt. On Clubhouse Rd. To 1st L On St. Andrews Circle. House On R.